agriculture –think Lamborghini, Mazeratti, and Ferrari. But exotic sports cars are not all that is manufactured, a diverse niche market for appropriate scale agricultural equipment has risen in the past century with a focus on small tractors of 8-45hp with very low centers of gravity (better for the not tipping) and a focus on efficiency by firms such as Goldoni, Grillo, Ferrari, and Antonio Carraro. My Grillo is on the small end of this niche with its 8hp diesel, but the engineering philosphy is the same – compact design, “agricultural” grade components like automotive clutches, locking differentials, diesel engines and real geared PTO’s. These are not belt driven modified lawn mowers playing at farm work; they are tools designed to be used daily for 20 years or more. 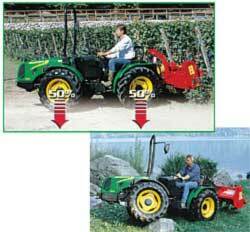 And they are so prevalent, that the niche has developed a name: Trattorini, or “little tractor”. One Straw is currently focused on sub acre permaculture – and at this scale a tractor of any size is certainly a luxury rather than a necessity, but we have found the serious soil working abilities of the Grillo’s rotaty plow to be very useful in converting fields or lawns to annuals or guilds when sheet mulching is not an option due to time or lack of materials. For traditional bio-intensive market gardening, the Grillo’s relatively gentle way with the soil, light weight (400#’s – about the same soil compaction as a human foot), and supreme maneuverability is a huge asset. But we also have designs on mid scale permaculture – a plot of 5-20 acres of swaled orchards and groves on contour with annual vegetable and herb crops alley cropped in between until the canopy fills in. Mark Shepards property near Viola, WI is the best working example of this I am aware of with its hundred plus acres of apple, chestnut, and hazelnut guilds planted on contour with vegetable and annual crops planted in the alleys, and ruminants rotationally grazing in sylvopasture to build soils. A system as large as this will benefit from a degree of mechanization for working the soils in the alley cropping, bringing in the harvest, and collecting and preparing composts and green manures, but is confronted with significant challenges due to its polyculture plantings. First, soil compaction is to be avoided like the plaque. With the tilled soil running between rows of permaculture guilds, the roots of the woody ag cannot be compromised by compaction from heavy equipment and poor cultivation. Second, the close plantings of trees and annuals limiting how close to the soil can be worked without damaging the canopy. 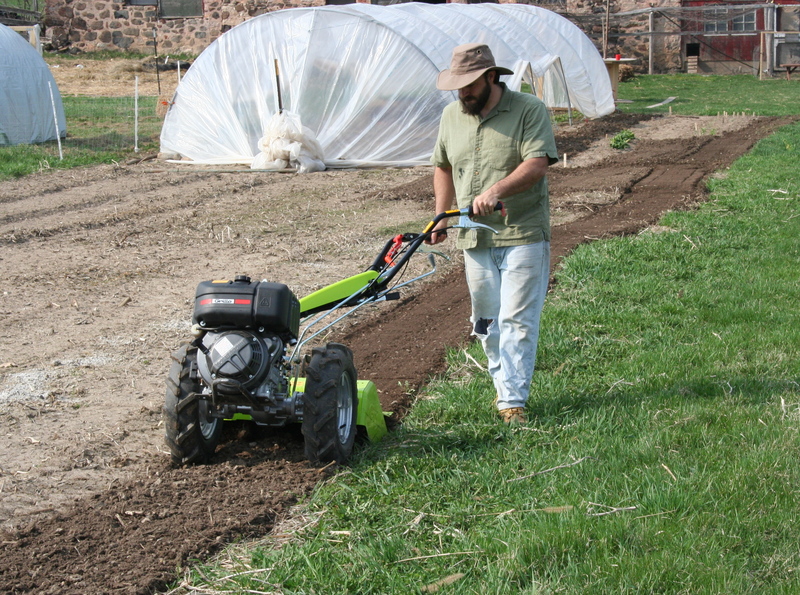 Next, much of the work on a polyculture will be in green manure production for soil building – mowing and collecting organic matter and this work is best down with the mower in front of the wheel so the wheels do not compact and crush the plants prior to cutting. Finally, turning radius is a huge consideration as the tractors will need to be snaking along curving rows that undulate with the contours of the land, and must interweave between alternating rows of orchards and annuals. Traditional American style tractors are very ill suited to this kind of work. The weight distribution of the tractors is over 70% on the rear wheels, disproportionally compacting the soils relative to the tractor weight, and very little consideration is given to tractor weight to begin with in the design process leading to poor power to weight ratios. The design of these tractors also have the driver sitting very high, causing issues with orchard canopies, and due to front wheel steering they require the use of brakes to turn tightly, destroying the soil tilth and regardless, the tires do not follow the the same tract, doubly compacting the soil at row ends. And all American designed tractors under 50hp have only the option of a rear mount PTO – meaning that the mower/collector must travel behind or next to the tractor. Off set cutting is not an option in dense polyculture alley cropping so any green manure collection would necessitate the tractor crushing the crop prior to harvest. There has to be a better way, right? I am a total gear head, so I have enjoyed researching this problem over the past several years and for every one of these problems, my research continued to turn me to one spot – the Trattorini. Specifically I am have settled on one particular model which I will use to demonstrate the elegant mechanical solutions to a midscale permaculture planting such as the one I described above. 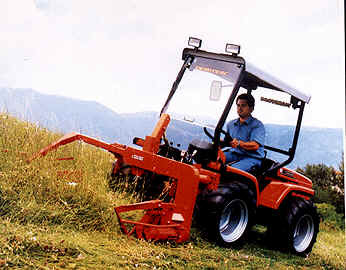 May I introduce my dream tractor: the Ferrari Cobram 40AR. … and this is what I hope my kids will mean when they say they want a Ferrari when they grow up! The Cobram 40 AR is built along the traditional Trattorini design of equal sized wheels to provide perfect weight distribution. Each wheel on this tractor is only supporting about 500#’s vs the rear tires of a similar sized Kubota supporting over 750#’s. Also the AR line features an articulating chassis – allowing for a turning radius 15% tighter than a rigid chassis, but more important it allows the wheels to track perfectly, reducing the soil compaction by half when turning. Seat height is reduced by at least a foot thanks to the more compact design – these tractors are literally designed to work under orchard canopies and in vineyards and it shows – fold down the roll bar and duck a bit and you can squeeze under a 5′ branch. The Cobram is offered with two engines, a 28 and a 38 hp Lombardini diesel and comes with 12 forward and reverse speeds providing significant range and enough power to run small haying equipment, 48′ spaders, seed drills, and large flail mowers without stressing the equipment. Remember these machines are designed to do all this at a 30% grade – Wisconsin will not tax this tractor, meaning the life expectancy goes up sharply. Driving compartment rotates 180 degrees to allow the PTO to be used in "front"
My favorite option on the Cobram and many other Trattorinis (including my Grillo) is their ability to rotate the entire driving compartment 180 degrees – effectively placing the PTO in the front of the tractor. The photo at right shows another Trattorini with the position rotated to allow the farmer to cut hay without the tires trampling the plants reducing the efficacy of the mower. This is absolutely critical for forage work in alley cropping where offsetting the mower to the side is not an option due to the close spaced rows of trees. Even in open field work like this, how much easier is it to not have to spend 12 hours turned around craning you neck trying to watch the implement while also driving the tractor forward? Thanks to the articulating chassis, the Cobram will tract exactly the same whether the tractor is operated in forward or reverse, effectively removing those two terms from use – the tractor will behave the same (steering, speed, etc) whether the PTO is in front or behind the operator. The useful measure of elegant design is that once explained, it becomes all but impossible to conceive of doing it any other way… its so simple and feels so “right” that one cannot imagine not having thought of it sooner. Rather like permaculture itself. The Italian / Mediterranean agricultural systems have much to teach us. The Trattorini culture also has developed appropriate size implements for all the traditional farming jobs such as forage collection (yes they still make small square bales! ), conservation tillage with spaders, seed drills, and all manner of mowers to collect green manures. They even have less intrusive cultivators like power harrows that till only 1″ deep, but still provide a clean seed bed suitable for Earthway seeding in rows of carrots while leaving the fungal net below in tack for soil ecology. From small scale grain production using reaper/binders and portable threshers to cultivation to forage and cover crop harvesting there is a staggering amount of tools available to the small scale agriculturist – many of which can compliment a permaculture system. Here in the US there are a few distributors for these freakishly useful machines. For walking tractors and implements like my Grillo and rotary plow, I HIGHLY recommend Joel at Earth Tools. The best source for the larger 4 wheel trattorinis is Ferrari Tractors out of California – their site is so rich with information that you can learn a ton just reading the dozens of articles – Eugene is truly committed to sustainable ag and even has a PDF on mechanizing permaculture. Permaculture has often come under fire from the fringe for its willingness to use equipment when it is justified. While the bucolic scene or using nothing but horse or hand power makes us feel good, it is also naive – there are no where near enough horses trained for field work today – not by a factor of 1000- and our population density is all wrong for labor intensive agriculture as practiced in the third world currently. Without horses or (ALOT of) people, one needs a tractor to move produce on this scale: an acre of apples will produce 20,000 pounds of apples, an acre of potatoes 40,000, carrots 24,000 etc. Add up harvests like that on a diversified, polyculture 10-40 acre farm and one needs something rather larger than a barrow to bring in the harvest, which on a 20 acre holding placed in produce agriculture could exceed 500,000#s! A trattorini like the Cobram 40 will use 50-100 gallons of fuel in a year on a 15-40 acre farm, which is easy enough to produce on a site that large with sunflowers, canola, peanuts, in rotation or nut trees. As we relocalize and focus on decentralized food production there will be much need for small scale agriculture models such as can be found all along the Mediterranean made more efficient through Permaculture design function stacking. May all your alley’s be cropped, your soils balanced and living, and all your swales be on contour. We have very little time before IT hits the fan. I used to think 20-30 years. Now I am hoping for 10. If not now, when? If not us, whom? A year of so ago these conclusions would have had me off planting 20 more fruit tree guilds and another acre of potatoes while starting a third renewable energy project like building my own PV cells from scratch. Now? I also realized that I, and many of my readers here, are dong things that less than 1% of the society are doing – things that are exactly what we need EVERYONE doing. I don’t need to personally do more –that will just burn me out– I need to get more people doing what we are doing. That means I will be continuing on the path I set this summer – to recenter on the Suburban Ag and redouble my efforts to Get the Word Out. I plan on building some 1-2 hour workshops and presentations, and do alot more tours. And to further the message, One Straw is also now on Face Book. Not only will this give another outlet to reach The Masses, but it will also provide a different medium for the message itself. FB is better at sharing photographs, links, and discussions. The blog will continue to have its weekly posts on whatever my gourd is chewing on, as well as the How To’s and essays. FB will get links, way more photos, my current reading lists, and more of my flighty musings. I am very excited to see where this latest step in the journey will take us. If you’re on FB, come on over, become a “fan” and join the discussion. God knows we have enough work to do! The past two days I attended the Bringing Bioneers to Wisconsin Conference. During it we watched a dozen or so recorded speeches from the Bioneers Conference last month. Several of the speeches were truly exceptional, but my favorite was Annie Leonard’s – creator of the Story of Stuff. Disarming humor in the face of calamity with a steady undercurrent of righteous rage. This Saturday I am honored to be a part of a 3 person panel at Madison’s Bringing Bioneers to Wisconsin conference that will be focused on “Beyond Backyard Bioneering”. My fellow panelists and I will be attempting to give some ideas to the attendees wishing to move beyond gardening, composting, and driving a hybrid. I will have the suburban side, and the urban sustainablitlity will be covered by James Godsil of Sweet Water Organics, a new Urban Agriculture enterprise in Milwaukee that is attempting to take Will Allen’s aquaponic principles and scale them up to a commercial size using an abandonded warehouse. Awesome! 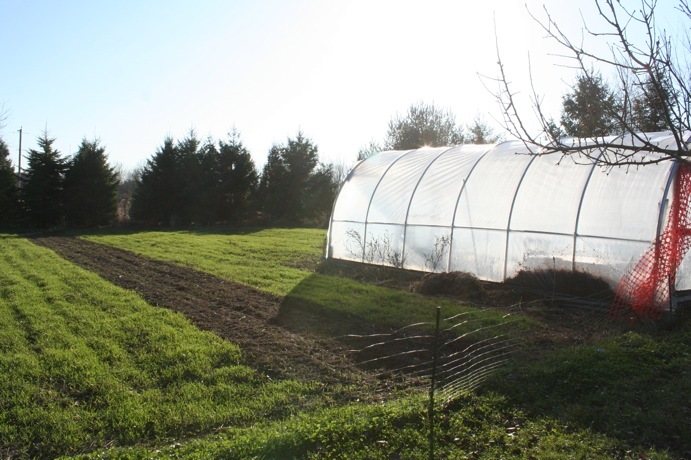 Covering more rural solutions will be Chamomile Nusz of Artha Sustainable Living Center – an incredible diverse and interesting farm that houses gardens, a B&B, and is a training facility for the MREA for renewable energy technologies. Heady company indeed! Our tabula rasa also came completely devoid of soil life. I was asked to talk about the transformation that we are working on here in our little piece of HOA paradise. We are heading into our 6th year here and I must say it has been rather fun to go back through the posts from the early years, reliving my first reading of Gaia’s Garden and my growing understanding on how to build soils and start permaculture, but most of all it is healthy to remind oneself on just how far we’ve come in so little time. The picture at left was taken the week we moved in – almost exactly 5 years ago. The “soil” was in a wretched state – no topsoil, and so little microbial life that barely even weeds could grow. It is amazing looking back to think that within 3 yeas I was harvesting 500#’s of food from this desolation. And it is that story that I will be telling and teaching on Saturday. When we moved in, the guilt of literally being Urban Sprawl weighed very heavily on me, and over that first winter I read David Holmgren’s Permaculture: Principles and Pathways. In the introduction Holmgren said something that grew into a stark commitment for me: that the suburban landscape that we on the environmental left so often lament, is actually one of our greatest resources. In no other time have so many people owned land – fertile, irrigated, arable land. 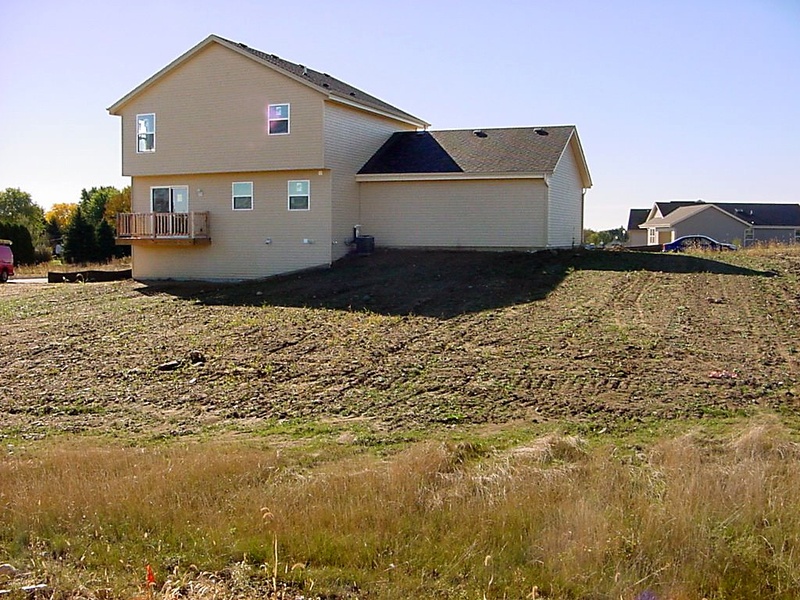 In true Permaculture style, Holmgren was challenging us to take the “problem” of Suburbia and turn it into the Solution. Thus my quest to push our property’s productivity. The project has had some simple guidelines. 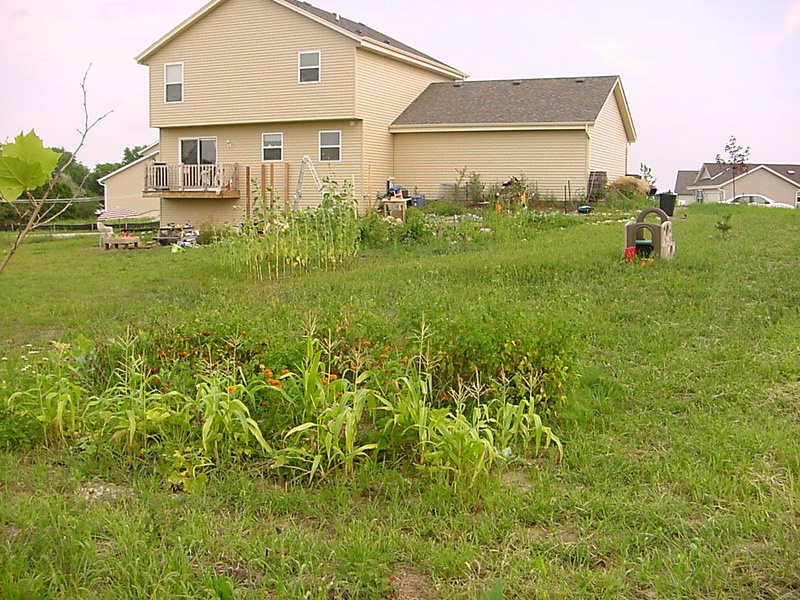 First, it was to be “normal” – no rows of corn in the front yard. In fact, due to our being in an HOA, the front yard was mostly off limits and even out back the edible landscape needed to conform somewhat to normal suburban aesthetics. Secondly, as we had small children and rather large dogs we decided to leave more than a bit of lawn. In fact over half the backyard was given over to the playground and grass for frolicking. That left about 4500 sq ft for our little experiment. 24" corn.... guess we'd better start composting! We started with 2 raised beds, about 80 sq ft each and discovered very quickly just how depelted our soils really were. 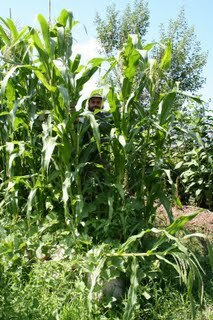 Even with 4″ of store bought soil amendments, our corn was a whopping 24″ tall the first season back in 2005. This was when I really started to dig into fertility management and started to read books like Gaia’s Garden which taught me about the soil food web. Up went our compost bin, but with no trees or landscaping, there wasn’t much to put in it so we talked to our local coffee shop and have been composting 100#s of their slop a week for the past 4.5 years– that’s about 12 tons of organic matter that dodged the dump and is now living a new life under our gardens. 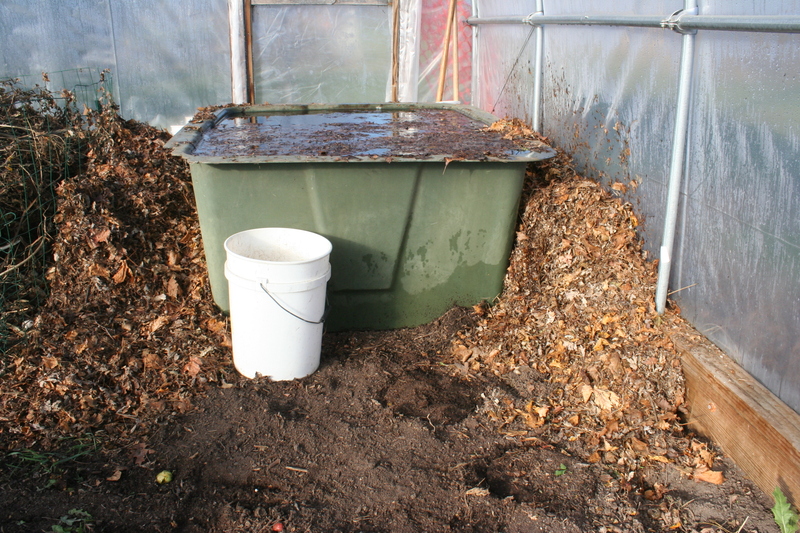 With adding not only that organic matter, but more importantly the microbial life from the compost the stage was set for me to begin putting my growing knowledge of temperate permaculture into practice. We planted a small 500 sq ft garden of prairie plants, and 80′ of fence line went into red clover. I went to the local nurseries and paid attention to what flowering plants the pollinators were swarming, and then bought them by the dozen. 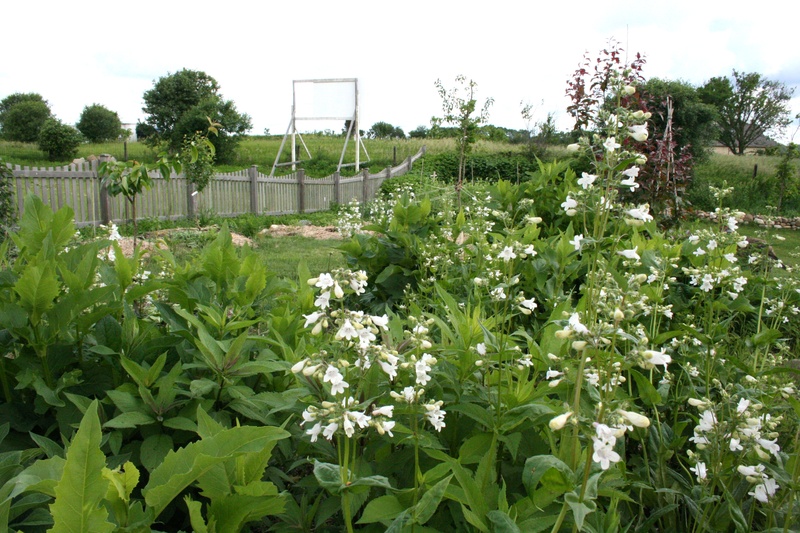 In went nitrogen fixing shrubs and mulch making plants like Russian Comfrey. "Pop" goes the garden. In just 2 years we can now grow 7' corn without supplemental fertilizing. By the end of our third year the garden was beginning to “pop”. The soil was becoming richer and we could now actually find a worm or two when transplanting. Our harvests were finally coming in – the raspberries and strawberries were producing and we were now up to 4 vegetable beds. We had built 2 rain gardens and were considering putting in larger, more permanent plantings like a small permaculture orchard. In 2007 our total harvest from those 4 beds with the 2 additional beds of small fruit netted us an impressive 500#’s of harvest – from about 500 sq ft– and even began to sell produce to the coffee shop that we got the slop from forming a nice resource circle. The next year, 2008, we decided to try our hands at Market Gardening, growing potatoes, tomatoes, lettuce, spinach, and peppers at a permaculture designed farm 10 miles north of our home. This was fantastically successful at not only allowing us to grow 1500#s of potatoes, but also at completely burning me out. I found it very hard to divert my attention between the two projects and our home gardens suffered. Still, the addition of 5 fruit tree guilds to the 2 in front and 3 more vegetable beds at home meant that our harvest was still increasing – this time to about 750#. Current readers will be fairly abreast of our current situation. In 2009 we continued to expand our Market Garden – this year harvesting about 2500#’s of potatoes and another several hundred pounds of tomatoes despite the blight. 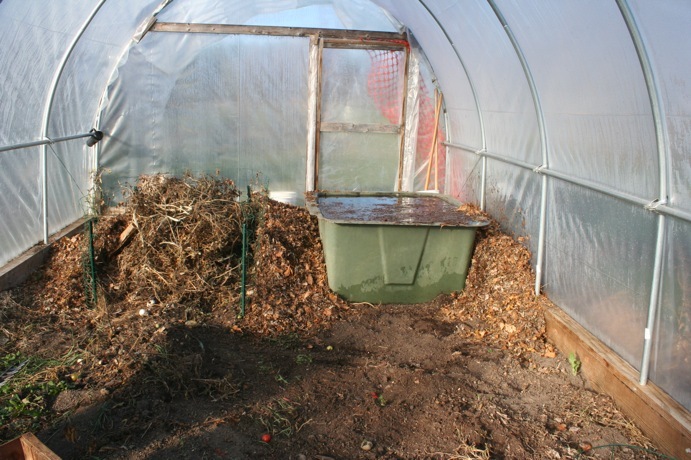 The home gardens were mostly on hold with no significant plantings other than a massive expansion in our compost crops (60 comfrey plants) and the addition of several black locust trees. From desolation to this in 4 years. The power of partnering with Nature! After 5 years we now have 7 annual vegetable beds with more than a foot of rich topsoil, 7 fruit tree guilds deeply mulched with vibrant soil food webs, and with the exception of quack grass weeding, very little maintenance needs. This year we took our first harvests from the orchard – with both our peach trees producing, and two of our pears as well. All told we now have 11 kinds of fruit from the exotic hardy kiwis and paw-paw to the typical strawberries and raspberries. We have harvests from mid March’s spinach through to the last green sorrel of fall, and the potatoes and garlic last until late February. By the time the last pint of jam is eaten we are within weeks of the first strawberries – late May in warm years. Our children are growing up to know that its the rare plant they can’t eat in the backyard, and those they can’t they understand play a vital role in our mini ecosystem – fixing nitrogen, attracting “good” bugs, or providing food for the worms. all the world’s problems can be solved in a garden.